This is a simple dialog for doing simple configuration jobs. For more sophisticated programming the BiDiB Wizard is recommended. The BiDiB system works with Unique-IDs and local addressing (Path). The local addressing can change after every startup of the system. At startup Rocrail creates a mapping between local address and Unique-ID. 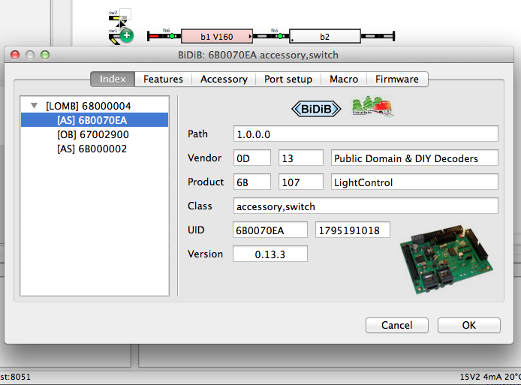 All BiDiB hardware modules have an identify button. If this button has been pushed the this dialog will pop up. After closing this dialog with the OK button the decimal UID number will be copied to the clip board to make it possible to paste this value into the Bus field(s). 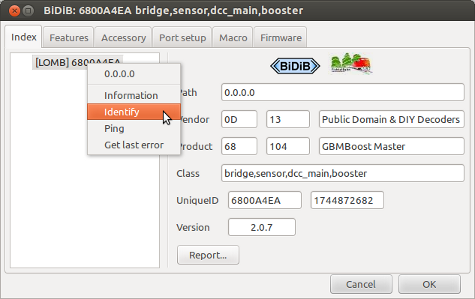 The GMB16T has also a button, but this is not implemented as an identify button because its not connected to the BiDiB bus. Pushing this button will set the GBM16T in test mode and will post continuously occupancy messages. The left value is the hexadecimal and the middle value the decimal representation of the Vendor ID. The left value is the hexadecimal and the middle value the decimal representation of the Product ID. In Rocrail this is the UID-Name value. This field is case sensitive! User defined string for identifying this node. Program the modified Username string. In Rocrail this is the Bus value. In Rocrail the decimal Unique-ID, must be set in the Bus field of the sensor or accessory interface tab. This UniqueID(Bus) is long and the one to choose is not always an easy job. The left value is the hexadecimal and the right value the decimal representation of the UniqueID(Bus) number. The printed board serial number should read V 0D P 67002900 in this example. In the tree view every node is prefixed with its class mnemonic(s) between brackets. Note: A node can provide more then one class. If an image is found with a file name formatted as "bidib-vid-pid.png" it will be shown on the index page. The image file size must be less then 50k in PNG format. The Reporting option requires a file name which must be specified by dialog. The file format is CSV and can be read and manipulated by most spreadsheet programs. All listed modules are port by port reported. 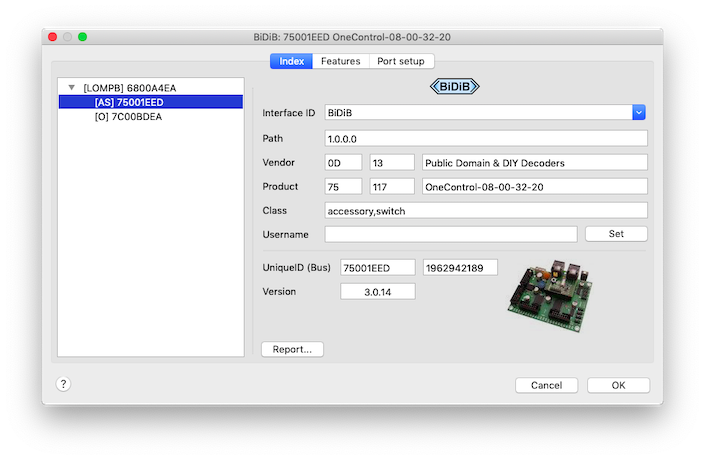 The RocrailID will be also reported if an object is linked to the uid:port:type. The CSV file imported and exported as PDF with LibreOffice. Sends an Identify message to the selected node which will accomplish flashing the LED on the module. Rocrail provide a basic implementation for reading and writing features. Reads all features of the selected node. This action is required to enable some other tabs in this dialog. Writes the selected feature with its new value; Check the documentation for writable features. Set this value to zero to disable this feature. A value of 1 will send every 80ms a message to the GBMBoost-Master. The port type to be configured; Check the documentation. 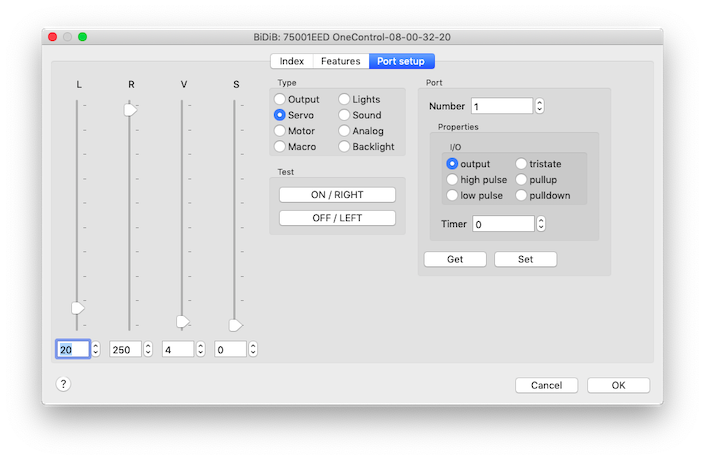 BiDiB Ports are zero offset based. Read the actual configuration settings of the selected port and type. Write the actual configuration values to the selected port and type. Use ON/OFF to see if the configured port is behaving as wanted. After releasing the thumb of one of the sliders the values are send to the module. 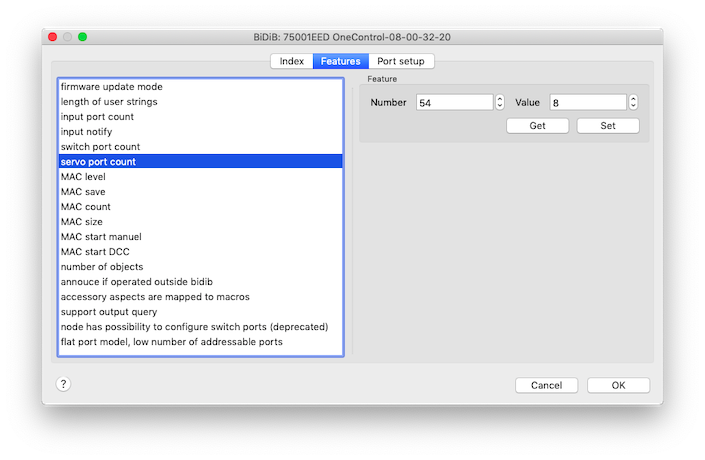 The port properties can only be set for port type output and if the selected module supports port configuration like OneControl. Timer: Used for I/O type pulse.